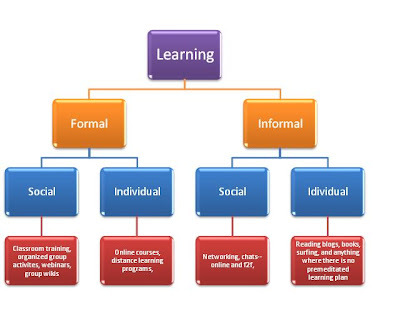 Today's #learnchat question revolved around formal and informal learning. The initial part of the session was spent on trying to pin down the meanings—denotation as well as connotation—of formal and informal. This led to some interesting Derridean debate bordering on Deconstruction in a bid to unravel the layers of meanings and possibilities encompassed by the two words. The term Social refers to a characteristic of living organisms (humans in particular, though biologists also apply the term to populations of animals and insects). It always refers to the interaction of organisms with other organisms and to their collective co-existence, irrespective of whether they are aware of it or not, and irrespective of whether the interaction is voluntary or involuntary. I think, when it comes to learning, the last sentence in the definition above is of importance. Whether we are conscious of it or not, our learning and what we seek to learn and from whom (especially, if it’s informal learning) is driven by our instinct of co-existence. Hence I believe Homophily plays such an important role in our interactions, especially in informal social learning. 1. Desire to set my own learning pace. 2. Desire to use my own style of learning. 3. I wanted to keep the learning strategy flexible and easy to change. 4. Desire to put my own structure on the learning project. 5. I didn't know of any class that taught what I wanted to know. 6. I wanted to learn this right away and couldn't wait until a class might start. 7. Lack of time to engage in a group learning program. 8. I don't like a formal classroom situation with a teacher. 9. I don't have enough money for a course or class. 10. Transportation to a class is too hard or expensive. 1. Can formal learning lay a foundation that will support the informal learning process? 2. Can we provide tools and systems (e.g. Subject Matter Expert Location Programs, Knowledge Repositories, etc. ) that enable the informal process to be more efficient and effective. Reduce the 15 hours a week to 10? 3. What can we learn from the informal process that may - or may not - inform a somewhat more formal approach? 4. How can we figure out when any learning - formal or informal - is not even needed? Where does 'just doing it' and moving on without ever learning a thing, become acceptable in terms of performance? 5. Can we discern where a more formal approach is really useful? Where does it realy help someone learn to begin to know and/or do something? What could then be the points of leverage that will encourage informal learning in an organization? Fantastic way to start my Friday morning. My wheels are turning. I was @ #lrnchat last night as well and pondered the many thoughts but really looked deeper into a suggestion that in an organization: Social Learning should come first in a formal structure as it can elude to and then strengthen the efforts to promote informal learning channels to be embraced. Thank you for the encouraging words. There was so much information flying around at so many levels that it was intially overwhelming. Nice post, Sahana. It's gotten me thinking about the difference between social vs. sociable. If all learning is social because we are creatures of our culture, then even informal learning by an individual (self-paced, yadda yadda) is social. But it's not necessarily sociable in the meaning of, "I sit down and chat with my peers about this topic and chew things over while having a good laugh and a cup of coffee." I have been thinking about these two words in relation to informal learning for a long time...especially so after reading Venkatesh Rao's post. I think most learning is a mix of "social" and "sociable". At least, that's the way it is for me. Then, my interactions with others (my sociable side) help me to reinforce/reinstate my understanding or even discard them depending on the discussions I have had. How would we define learning happening via the social networking sites? Informal social learning or informal sociable learning or a blend? Under Informal Learning, point #5 refers to "Without measurement or performance matrix" It is not entirely true. If say, organization has to realize the measurement value or performance matrix, it should not be controlled by timelines or management. For example: It is a fact that many of us improved our typing speed and if I could be the case, enhanced my writing skills only through chats. There was no measurement then. But if you put in measurements, it could be the quality of writing, improvements in time to delivery cycle, number of ideas and literature created and their value contributed to the organization. Sadly though, these are neither learning measurements nor in HR radar. Thus informal learning suffers from perception error.